Like many of my ventures in workbench making, this one was inspired by someone else who trod this pass long before me. In this case the guilty party was David Barron, the inventive and highly accomplished Brit who has devised an impressive number of woodworking accomplishments and innovations. 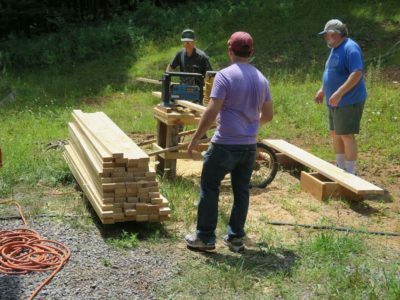 David’s youtube video spurred me to make my own, and host the only workbench-building workshop I’ve ever heard of where the attendees actually went home with a completed bench. While my bench was nowhere near as elegant as David’s. it was the foundation for a high performance tool. 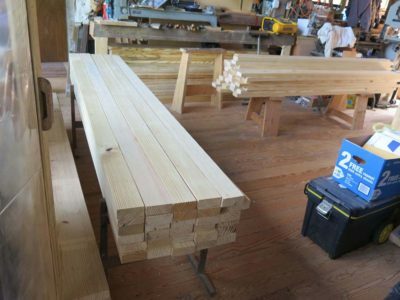 My first step was similar to a lot of my benches, selecting nice clear southern yellow pine for my material. I have a fairly nearby source for high quality SYP 24-foot 2x12s which I have chopped into 8-foot sections. These run about $1.50 a board foot, which is entirely within the realm of acceptable from my point of view. After choosing the best boards from my inventory I ripped them into three equal pieces of approx 3-3/4″, then skinned them with the planer to provide clean gluing surfaces and identical dimensions (these pics are from the workshop). 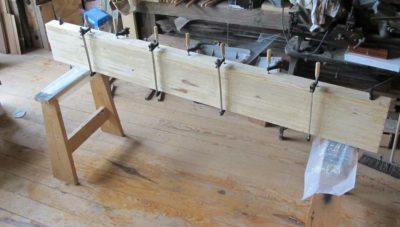 I glued up the lamination to occupy the spaces from the back of the front legs to the front of the back legs before moving on to cutting and adhering the mortises, which came next.